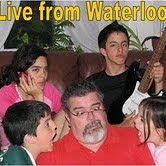 Live from Waterloo: Watch the penguins!!! What a cool link! The pengiuns were pretty quiet when I looked in on them but it was cool to see just the same. I think that I'll come back later and check in on them. Make sure you do, Biddie. We were watching them on Friday, as they were all arriving, and it was awesome. Then we watched them a little more again today; even when we don't see a thing, we like to listen to the sounds of the sea. gabriel - I was thinking teh same thing..about the sounds of the sea. I miss Nova Scotia, and the ocean so much. I could listen to the sounds all day! I think that Shawn will like watching the pengiuns, too. They are his fav animal, I think. I wanted to ask you about Mings. You mentioned it in one of your previous posts. Where is it? I am assuming that it's chinese food. I'd love to try a new place. Sure. Ming's is on Phillip St, almost on the corner with Albert St. There's a plaza there that has a Tim Hortons, a bicycle shop and a few more restaurants.